There’s nothing nicer than a pamper night, is there? Especially when you devote a whole evening to yourself and do the full pamper routine from head to toe – bliss! I’m gonna run through the main elements of my pamper night and then dream of a hot shower when I get home from work! The Hot Shower or Bath | You have to start with a proper, indulgently long bath or shower. I don’t really like using the bath in our flat (does anyone else get like this in rented places) so I’ll tend to opt for a shower instead. I’ll throw a hair mask on such as the Ojon Rare Blend Moisture Therapy Conditioner for five minutes, just to give the ends of my hair a boost and then exfoliate my skin from head to toe with some scrubby gloves. I have to do this every time I shower or I don’t feel right! The Moisturiser | After I’ve come out of the shower, I’ll slap on some of the most moisturising products I own, as I tend to neglect my body a bit in that department. The Soap and Glory Smoothie Star Body Milk is a great option for this, as it’s hydrating but not overly thick where you feel like it still hasn’t sunk in hours later. The Face Mask | I love a good face mask and try to use one at least twice a week, but one of those times has to happen within my pamper night! 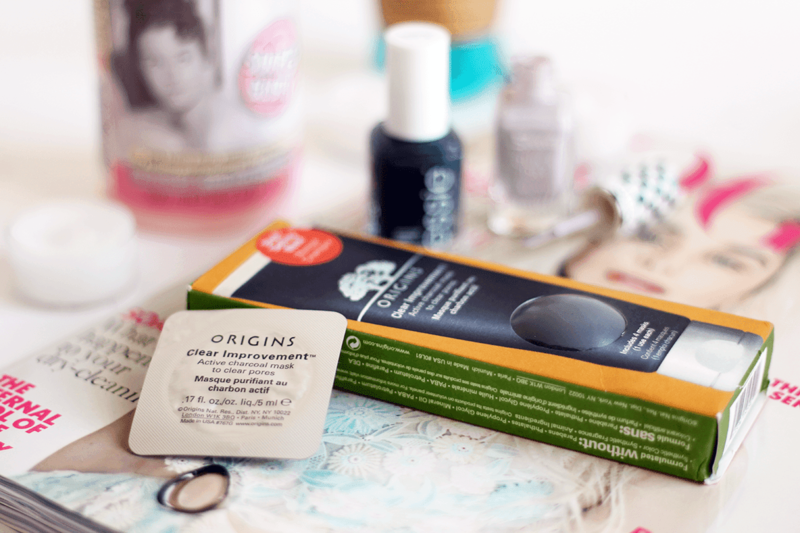 I always find clay or cleansing based masks more effective, so the Origins Clear Improvement Mask Pods are fantastic to throw on! The Manicure | I am a nail polish addict, so my nails have to be done every couple of days, literally as soon as I have a bit of tip wear. I’m a bit pedantic about it – chips make me stressed! Weird, huh? Anyway, once I’m finished with my skin, I move onto the manicure and give my nails a fresh coat of paint! The Relaxation | The atmosphere when chilling is kinda important to me. I have a candle lit pretty much every day, but it’s super important if I’m doing a pamper evening. I also try and set aside an hour to read a book or some magazines too, as I never give myself time during the week! Busy busy. How does your pamper night go? Let me know in the comments!